Following on from last weeks webinar with Sophie I have spent the last few days working on a methodology to fit within Nature and Wellbeing theme for my Work in Progress Portfolio (WIP). The challenge still exits where the subject matter is still very large, so I am now further simplifying down. Of the three locations discussed in week 2 – I am now only working in two set spaces – that being the RSPB reserve and the river by Otterton. I feel for now that any areas away from this could be better covered in later works. I have also decided to follow the changes of autumn as a thread to the work. During this time of year, very vibrant colours appear and there is a stark change from the greens of summer to the reds, browns and yellows of autumn. My focus for my WIP will be to balance such a Wellbeing in Nature approach with a visual representation of autumn from the point of view of the river. The images produced will ask a question – the answer is beholden to the viewer. As a start, I wanted to experiment close to home. 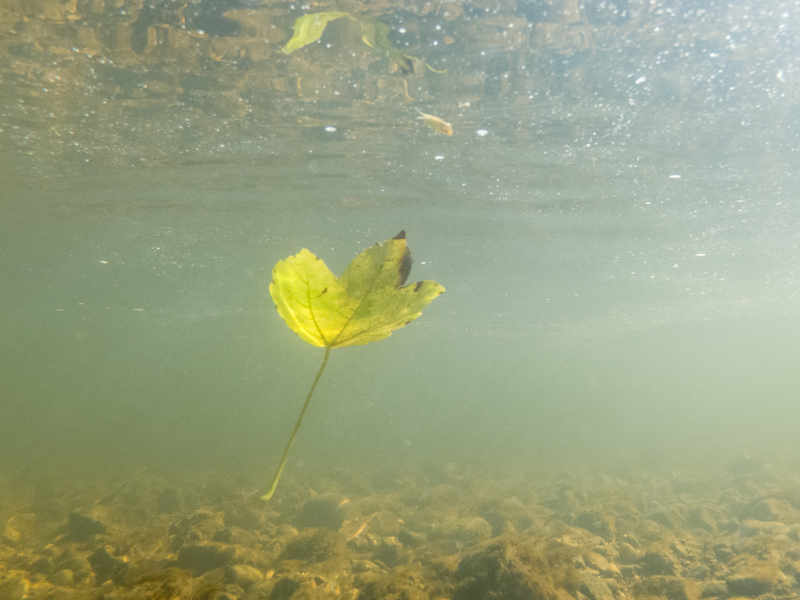 I shot a series of images of leaves floating downstream. These were unique in that the leaves were submerged under the water. For me this showed a journey within a journey – the leaf is travelling at the speed of the river – but has gone from above to below in the process. There are considerable challenges on shooting such a subject matter, but with practice, I was able to compose a series of images that encapsulated this journey. Of the images, I chose one and put it onto my Facebook account with the simple question – how does this make you feel? I had in all 17 comments plus private messages. All of which gave a different response but all were linked by the same theme – emotional connection. For some the leaf was calming or peaceful – for others, it was at the start or end of a journey. This exercise reinforced the notion that images posed alongside the right ‘question’ could achieve a well-being response beyond the original subjective view I had when composing the images. Of the responses back it can be concluded that each image on its own can be effective, but for more than one to be shown together requires a clear narrative. It was not felt that this collection represented any kind of journey, but did instead have a focus on reflection and detail. This exercise has helped me measure the response and impact such an approach has. I now have to look at what context to put this work into in order to generate a naturally telling story.